When it comes to watering, there seems to be no perfect solution. Automated systems increase the risk of plant damage from over or underwatering. Conversely, hand watering can be both labor intensive and time consuming. It was this challenge that inspired Jared and Jordan Dekker (owners of Dekker Brothers Greenhouse in Hudsonville, Michigan, and the cover story of our October 2015 issue) to work with Len Logsdon to perfect a product that would take the guesswork out of watering. Their solution was the Control DEKK Oasis. Pictured: The Control DEKK Oasis system weighs each basket and waters it according to its predetermined weight. It works on any automated basket conveyor line and can be controlled at the conveyor or from a PC or smartphone. 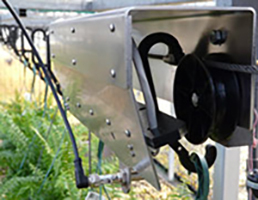 Designed and patented to work with automated basket conveyor lines, Control DEKK’s Oasis will give growers the peace of mind that all plants will be uniformly watered. As each basket passes through this sleek system, its weight will be determined. If under the predetermined weight, the smart controller will open the water valve for the time specifically needed to reach the grower’s target weight. Constructed of stainless steel and enhanced UV-stabilized polymer, this 5 in. x 7 in. x 18 in. system can be installed on existing cable conveyors. A controller and local user interface permits the grower to control and monitor activity either at the conveyor or from an office PC or smartphone. The end result is a reduction in water use, production costs and labor with the added benefit of overall plant uniformity. Still in its pilot phase, Jared and Jordan will be installing and trialing the system both in their own greenhouses and with some local growers. Original article from Grower Talks here.